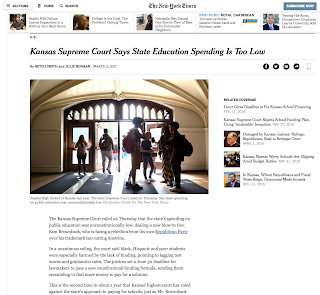 Last week’s Supreme Court ruling requiring increased funding for Kansas schools did not surprise many people, but it still complicated an already challenging legislative session. The goal post moved…a lot. Lawmakers must adjust accordingly. House Bill 2178 was a good first attempt at fixing our broken tax code, making needed structural reforms to stop future revenue hemorrhaging. But it only generated $460 million annually — far short of closing the $900 million structural shortfall created by Governor Brownback’s tax policy. Many still supported it (myself included) because a school finance ruling was likely to offer a later opportunity to finish the job. Now that the school finance ruling is upon us, lawmakers must restore $500-$800 million to schools in addition to filling the $900 million structural shortfall. House Bill 2178 generates far too little revenue to still be considered a responsible solution. Comprehensive tax reform should still come before any budget action. Many reports continue to characterize the gap as $350 million in 2017 and then $580 million in 2018. That’s only accurate if lawmakers raise $350 million in recurring revenue this year or make another $350 million in cuts. There hasn’t been much appetite for either of those options. It seems more likely the Legislature will borrow its way out of 2017 instead, as proposed in House Bill 2052 (the House rescission bill). If that happens, Kansas will face a $932 million gap in 2018. Just look at the basic numbers: the 2018 revenue estimate is $5.536 billion. Meanwhile, delivering the current level of services in 2018 is projected to cost $6.468 billion. Bear in mind that figure does not account for any payback for a Fiscal Year 2017 loan. Nor does it include any additional investment necessary to comply with the court’s order. There is simply no way to proceed without first stabilizing the revenue stream. Ten hundred million one way, one billion the other. Absent hundreds of millions more in budget cuts, Kansas faces a minimum structural gap of $1.4 billion. Billion. With a “B.” A tax reform package that fails to close this minimum gap guarantees yet another devastating shortfall next year – even if a school finance formula is phased in over time. Is that really how we want to spend 2018? This is the moment to end the crisis in its entirety. Governor Brownback’s tax experiment dumped Kansas into a fiscal hell. Now even he reportedly seeks an emergency evacuation plan. Except – assuming it’s true – the Governor’s plan would only save himself. Kansas is on its own. If even Governor Brownback can’t summon the courage to stay and fight for his failed tax experiment, why should any lawmaker defend it – or preserve any part of it – at the expense of Kansas schools and communities? These are jaw-dropping figures, leaving no good options. Legislators deserve our thanks for not jumping ship and for demonstrating courage to put Kansas back on a practical path forward. Please keep going. It won’t be easy, but please do not stop short of ending this experiment once and for all.